Republican field is weak. 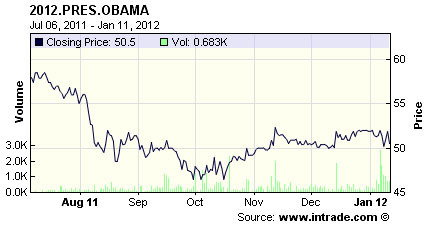 Hell, Intrade has only intermittently put Obama’s chances over 60 percent for the past year, and he’s barely been better than an even bet for the past six months. At the same time, I also happen to think that Levin is being a wee bit too pessimistic when he hauls out a few bits of polling and economic data that, he says, “suggests there is no self-evident path to re-election for the president.” I think Obama’s record is a little more popular than he thinks, that Republican obstructionism is a fatter target than he admits, and that Mitt Romney has some glaring weaknesses that Team Obama is going to rip into mercilessly. So Obama is hardly a dead duck. But he’s not a shoo-in either, and I really don’t think anyone over the past year or so has ever suggested he is.